This is a lovely, simple story in French. 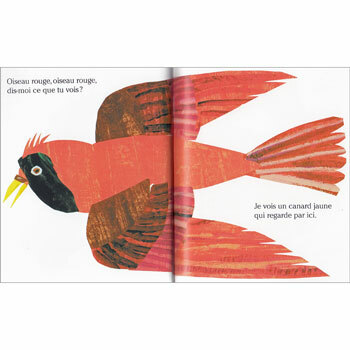 Each double page spread introduces a new colour and animal and the repetitive text makes this a good story for young learners of French. Ours brun, dis-moi ce que tu vois ? is written entirely in French and is aimed at native French speakers. I love this story and find it a great resource for teaching colours and animals from preschool age up. It has lost a little of the flow that the English version has in the translation, hence the 4 not 5 stars, but is still a lovely book with simple repetitive text and colourful illustrations which children of all ages respond to. A great addition to my teaching resources. I had been using 'Brown Bear, Brown Bear, What do you see?' to teach French animals, colours and adjectival agreement, translating as I went along, so lovely now to have a proper French version. It is a small slim softback book, so not quite so easy to share with a class, but excellent nonetheless. 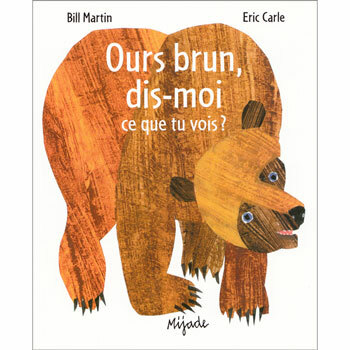 I am using this book to introduce the colours in French to our Year 3 classes. They love it!